This is the drawing I meant to do two months ago, the start of one of Vobster’s Aquathalons. That’s me, the odd one out – the one without a wetsuit and who has no intention of going for a run either. It’s always good fun though and the presence of lots of frantically thrashing neoprened bodies makes me swim a little bit faster! Yesterday was August’s Aquathalon, and I have to admit I skipped it in favour of swimming a lot more laps, but I was there in the lake at the same time, doing my own thing. And anyone who was there, I know you all had white hats on not red ones, but red looked better: Beauty is Truth, Keats said so. 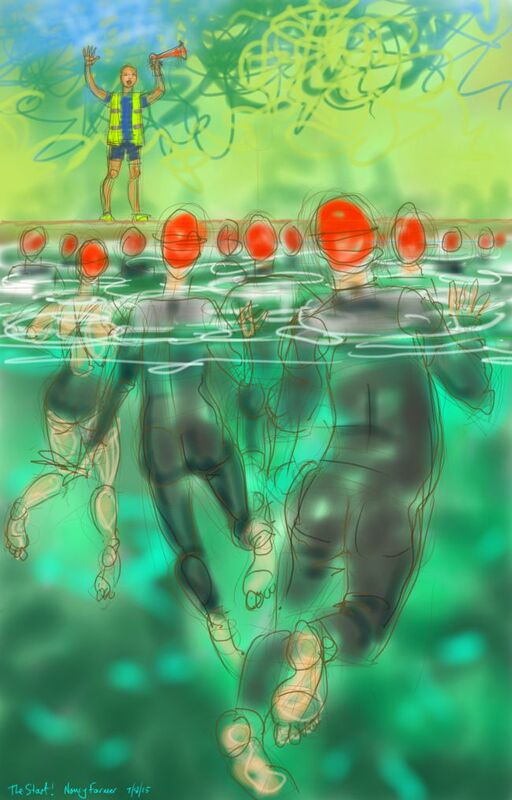 This entry was posted in Places, swimming and tagged aquathalon, art, drawing, illustration, open water swimming, sketch, swimming, triathalon, Vobster Quay on August 7, 2015 by Nancy Farmer. I really love your swimming pictures especially ‘the start’ as it reminds me of the GNS. I would really like this as a framed print. Are you able to do this? A5 – £8 Image size around 4.5 x 7 inches. A4 – £15 Image size around 5.5 x 9.5 inches. A3+ £29 Image size around 11 x 18 inches.